While in Indiana at the State Fair, D and I made our way into the 4-H barn “after hours”. Okay, it was really about 5pm, but this was when the real deal started: Well after top-notch vegetables had been judged, local wines swirled and alfalfa blocks adorned, the local apiaries took the stage for a little bee demonstration and hints of the trade. We seemed to be the only ones fascinated by the discussion, complete with a live demonstration behind the speaker (a man relating the talk with live bees and hive). We asked our questions then dove into samples of over one dozen honey varieties as well as honey butter, honey laced yogurts, honey sticks, honeycomb, beeswax blocks and more. Slightly stunned when we asked for a good contrasting honey for the soon-to-be-purchased molasses-hued buckwheat honey, we were given a deep shrug: “it’s honey.” Obviously not one of their top salespersons. Buckwheat honey and an amber toned wildflower honey made it into our bags and to New York in one piece-- along with sorghum, whole wheat flour and cracklin’s still fresh on the mind. Back in New York, worlds away from Indiana, I was avoiding tourists in Chinatown. Ducking into one of the hundreds of food stalls that line the narrow streets, I found myself confronted with noodles. Hundreds of noodles: cellophane, egg, rice, ramen and soba (or buckwheat). The honey must have been on my mind because I grabbed a pack of soba noodles before heading home. The excitement ended there and for weeks the noodles sat in the cupboard. The honey on the other hand, made excellent hot toddies-- a quick fix-me-up for a recent sick spell. Yet still the noodles sat. This dish is beyond simple to make. The rich buttery taste these noodles provide is a luxurious accompaniment to seafood. And because buckwheat is actually a fruit (a relative of rhubarb), not a wheat, it is safe for all those non-gluten folks, full of fiber, potassium, manganese and helps keep blood pressure and cholesterol levels down—how is that for tricking someone into eating pasta? Even better (I’m a visual person), the purplish hue of these noodles look amazing against bright vegetables and seafood. 1) Peel and devein the shrimp, rinse calamari; set aside. 2) Bring water to a rapid boil in a medium pot. Add noodles, stir to separate and cook about 5 minutes, until done. 3) Drain water, rinse noodles with cold water and place in serving bowl. Return pot to stovetop over medium-high heat; add olive oil. 4) Add garlic and bring to a sizzle; about 3 minutes. 5) Add shrimp, calamari and arugula, cook until shrimp turn pink and curl; about 4 minutes. 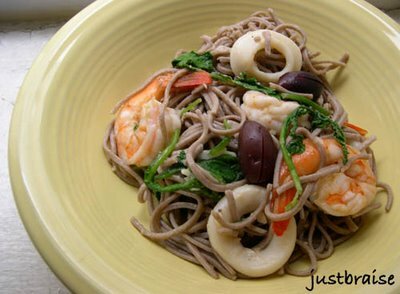 6) Add shrimp, calamari, arugula, Parmesan and olives to soba noodles. Toss to incorporate. Add more olive oil if desired. Serve warm or cold. I can remember the moist zucchini-walnut bread my mother used to make when I was growing up. That, coupled with her infamous carrot bread, were worthy treats in the house and always much appreciated. In my years away from home I craved the breads (mind you, not cakes) and often called, requesting a loaf to be air-mailed to me without haste. Lucky for me, my mother usually obliged. These days she has misplaced the treasured zucchini bread recipe. Sure it came from the depths of Joy of Cooking , we have failed to find the true source of the recipe; unable to replicate its sweet and wholesome moistness. Knowing the bread eluded me, I began preparing these zucchinis much the same way my mother would have: by grating them into a tall pile. I continued on the fly: Throwing in a few more ingredients and sticking these on a hot buttered skillet. These might just be the next best thing—even better, D played a vanishing act finishing his in no time flat-- allowing me to dine with company. Oh, and that menacing darkness that hovers closely behind the zucchini cakes in this picture? Some leftover Louisiana-style beans made with a leftover ham shoulder—the combination was delicious! These pancakes are great for breakfast with a poached egg or as a dinner with beans (as pictured here). They can be added to a sandwich (a sort of veggie burger), had with a sour cream based dipping sauce, or simply snacked on the go. They are also quick and easy to make. Makes about 12 4-inch pancakes. Active time= about 30 minutes. 1) Grate zucchinis. Grab up a small handful of grated zucchini and wring out the excess water over the sink. Set drained zucchini in a medium bowl, set aside. Continue until all zucchini is drained then dab with a paper towel to get remaining moisture out. 2) Add eggs, cumin, Worcestershire sauce, Parmesan, chili pepper, Tabasco sauce, salt and pepper to the bowl. 3) Use hands to incorporate all ingredients evenly. 4) Place butter on a medium sauté pan over medium-high heat. Once pan and butter are hot (butter will subside its bubbling and smell nutty), place small even handfuls of the zucchini mixture around the pan, use a spatula to gently press the pancakes flat. Allow to cook about 5 minutes each side, until golden brown. Serve warm, topped with fresh grated Parmesan. Hop on over to Sweetnick's for ARF Tuesday! 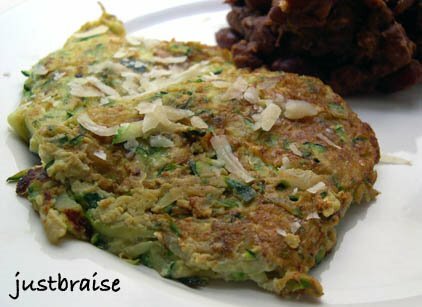 Tags: zucchini pancakes, zucchini, squash, ARF. The recent spell of cool, wet weather along the east coast was nothing but pleasant for me. Fall foods are some of my favorite, full of hearty warmth. The passing storms sought to bring out the culinary colors of the season and my own penchant for soups. In gloomy weather, reds are a bright choice for foods. Red makes us think of warmth, be it the heat of a hot pepper or an August sunset. The color brings us memories of the summer; think warm vine ripe tomatoes, raspberries or strawberries. When the dreary grey days of fall and winter have us down, there is nothing like a bright bowl of soup to cheer us up. 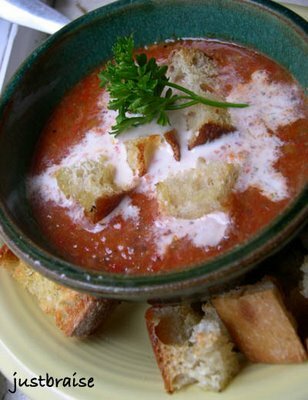 In the past, I have made brilliantly hued and high flavored roasted red pepper and tomato soup, as well as roasted tomato soup. Both delicious: the sweetness of pepper and tomato are enhanced in the roasting process; adding a pleasant finish to any soup. In addition to the glorious red bell pepper, I adore mushrooms. Their earthy aroma and buttery flavor can compete with most anything delectable. So how to combine the sweetness of a pepper and the robustness of the mushroom? A soup of course-- Full of sweetness and heavy undertones. Perfect for these the days when fall looms ahead, yet light and colorful enough to remind us that summer still holds. Serving Size= 6-8 persons. Active time= about 30 minutes. Inactive time= about 30 minutes. 1) The easiest way to roast a red pepper is in the broiler by following step one of this previous soup post. Alternatively, I prefer to use the “baba ganoush method:” rotate over an open flame (using tongs) until the pepper turns black, throw it into a paper bag for 15-20 minutes, peel off black char, discard innards, add to soup just before broth. 2) Place onion, garlic, celery and mushrooms into a large stock pot with 2 Tbl butter or olive oil. Sauté for about 10 minutes; until onions turn translucent and limp and mushrooms begin to brown and release juices. 3) Add roasted red peppers. 4) Add chicken broth and parsley. Cover, bring to a boil, then reduce heat and allow to simmer for 10 minutes. 5) Using a handheld blender or carefully in batches with a regular blender, puree the contents until smooth and even. If thicker than desired, cut soup with a little water. Taste for flavor, add salt/ pepper to taste. 6) Garnish with cream and parsley and serve with grilled cheese, peanut butter and jelly, cucumber onion (or any other preferred sandwich), a hunk of crusty bread, croutes, good cheese, a salad, or on its own. Tags: roasted peppers, red peppers, mushrooms, soup. Pascal, over at Home Recipes, tagged me for the meme created by Traveler’s Lunchbox. Exciting, as this is my first meme. You can check out all the progress of this project in TL’s comments. The subject is “Top 5 to Eat Before You Die” inspired by the BBC’s 50 things to eat before you die. Personally, many of the items on the BBC list appear to be more challenges than must-have food items. 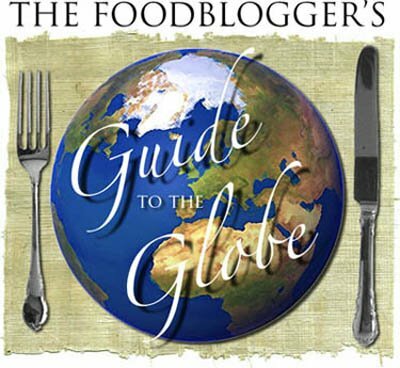 Leave it to the food bloggers of the world to create a more proper list. The “Top 5 Before You Die” is an attempt to highlight the delicacies of World cuisine, which seems to be getting more difficult (in a “pure” form) with the expansion of fusion foods. I usually shy away from Top 5/ Top 10 lists because I have a hard time remembering enough of my “all time favorites” to assemble. This top 5 list almost seemed too easy, maybe my memories of food are greater than media. I am sure if I give myself more time to think this over the list would change [go on forever] so I’ll end it here. Everyone please feel free to add your own Top 5 in the comments, it would be interesting to keep this growing. 5) Something you have grown yourself. 4) Arabic Coffee from a street vendor in Beirut, preferably along the corniche. 3) Fresh Norwegian Shrimp caught that morning and eaten while boat watching along the Bergen harbor. 2) Warm Fresh-Plucked Peach seconds after it is pulled from the tree. 7) Kopp’s Custard in Milwaukee, WI. You can order it online and I have been daring myself to order the 10 pint minimum for years now. 10) Fresh Crepe from a Parisian vendor, preferably lemon-sugar. Tags: top 5, food lists, meme. I knowingly had lemon curd for the first time this past summer. I know, a late bloomer for all things delectable. The truth is, the stuff is not in my blood and I am sure my parents thought better than to get me started on another sugar addiction (I already had ice cream and cookies and found Nutella on my own). D, on the other hand, has curd running through his veins: From his southern pull to his British blood, the boy is practically dripping the goop— and while we’re on it, clotted cream as well. It was when the two of us spent some time in London and around Scotland this summer that D ordered it with gusto and the stuff popped onto my radar. It did not take long for my cravings to begin. The first tasting was at high tea: scones, clotted cream and lemon curd—oh awake from the dreaming-- the sweetest of combinations! How the Brits avoid title as World’s Fattest is beyond me. Upon arrival in Scotland we glutted ourselves on the substance and bought it in gift form for our return (I was informed it’s quite expensive in the U.S., which upon recent investigation found it is in fact, expensive). We returned with our own little curd booty. Despite attempts of opening the sacred jar, it remains, stashed in the cupboard for a rainy day when the scent of scones fills the apartment. A few weeks back when a whopping lemon meringue pie graced the table, I hadn’t the slightest notion that the filling I produced was, more or less, a curd. Sure, it was custardy, but when I think “curd” images of cottage cheese and sour milk fill the void. In the attempt to work through an over zealous fruit purchase, images of vanilla custard clouds with mountains of fruit undulated through the sky. But as I searched for recipes, none caught my fancy. Instead I found this recipe for lime curd on epicurious.com and was shocked back to Britain. I prepared this little concoction. Let’s just pretend this is a healthy way to enjoy this stuff. Serving Size= 6 persons. Active time= about 30 minutes. Inactive time= about 2 hours. 1) Just before serving, fill each walnut-graham cracker crust ramekin with lime curd (this will prevent the crust from becoming soggy). 2) Top with 2-3 large spoonfuls of fresh fruit mixture. 3) Can be served with a dusting of freshly ground walnuts, a splattering of heavy cream, fresh whipped cream, a scoop of ice cream or a light cookie. 2) Combine graham crackers and walnuts in food processor or blender. Process until grainy. Add melted butter, process until well combined. 3) Press graham cracker mixture around the edges and bottom of 6 ramekins. Arrange on a cookie sheet and bake 10 minutes, until edges turn golden. 4) While crusts bake, begin the lime curd (below). 1) Add sugar, lime juice, egg yolks and butter to a heavy saucepan over medium-high heat. Whisk to combine. Set lime peel in a heat-proof bowl aside. 2) Cook over medium-low heat until thick, smooth, and just beginning to bubble, stirring constantly, about 10 minutes. 1) Add all ingredients to a bowl and stir to combine. Let set for at least 10 minutes before assembling tart. 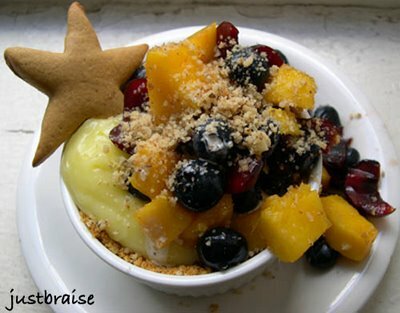 Tags: fruit tart, fruit, mangoes, cherries, blueberries, lime curd, dessert. The chicken wire that surrounded my bucket garden may have been stolen, the tomatoes have passed their prime-- no longer providing fruit, the remaining Swiss chard (now unprotected) was torn apart by critters and the last of the lettuce was fried by the last heat wave. But I still got it. If there is one thing that many humans are too stupid to steal it is a short green, fairly plain looking plant. If there is one thing that animals cannot stand to eat it is a bitter treat. A whole bucket of arugula is the lone survivor of my summer city gardening experiment. Without roof, without balcony, without anything more than chicken wire and two feet of semi-sunny pavement between the outside world and five buckets, I did quite well for myself: (tango and lollo) lettuce and tomatoes, White Hailstone Radish, and some Swiss chard (back in the chicken wire protection days). In hopes of a possible garden resurgence I sprinkled the remaining arugula and radish seeds over the cleared buckets. Both vegetables prefer cooler days so hopefully the turn of weather will keep the growth alive. Until then, I’ll be dreaming about this sweet and bitter late-season salad. Serving Size= 2 persons. Active time= about 10 minutes. 1) In a medium pan on medium heat, warm 2 tsp olive oil. Once warm, add shaved corn kernels and green beans. Sauté about 4 minutes; until corn and green beans darken. 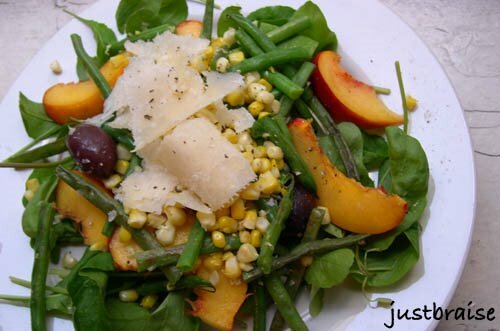 2) Add beans and corn over bed of arugula. 3) Toss peach wedges over top, add olives and Parmesan shavings. 4) Just before serving, whisk together apple cider vinegar and lime juice. Pour over top and top with fresh pepper and salt to taste.